A day after questions were raised about actress Lindsay Lohan's arrest on Wednesday for allegedly hitting a pedestrian and leaving the scene of an accident, the NYPD released surveillance video of the incident. But in the video, in which bystanders' faces are blurred, it is unclear whether a man was actually struck. Authorities initially said the 26-year-old Lohan allegedly struck a Jersey City man while trying to navigate her 2010 Porsche Cayenne out of an alleyway between the Dream Hotel and the Maritime in Chelsea around 2:30 a.m. Wednesday. The surveillance video shows Lohan flashing her headlights as she signaled to the man to move out of her vehicle's path. She continued to drive forward and her right bumper either brushed by or completely missed the man. 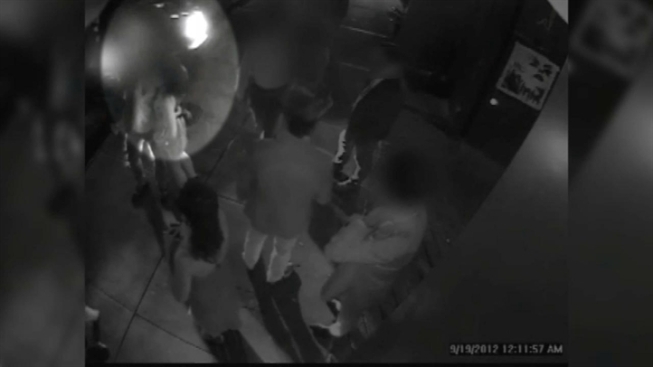 After Lohan passed him, the video shows the man running after her, yelling. It wasn't known what he said. Prosecutors are waiting for medical records before deciding how to proceed with the case. The alleged victim in the case, Jose Rodriguez, a restaurant worker, was treated for a reported leg injury at Bellevue Hospital and released.